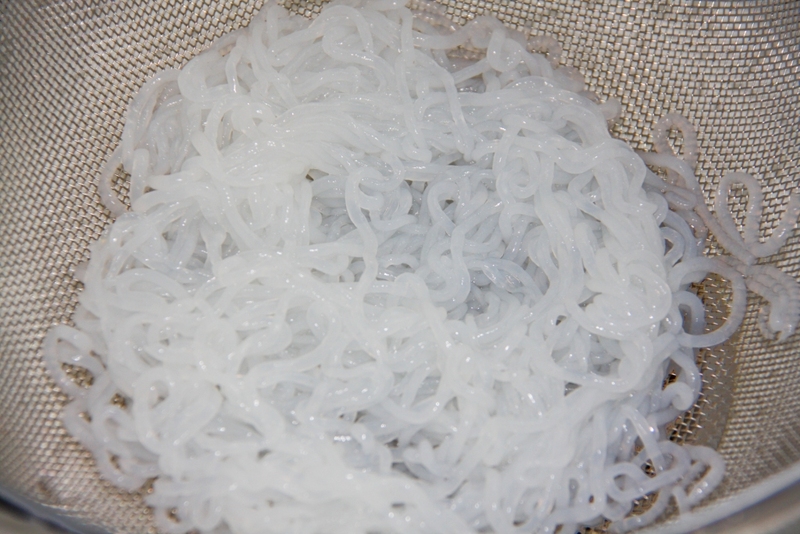 In yesterday’s post I introduced you to Shirataki Miracle Noodles. 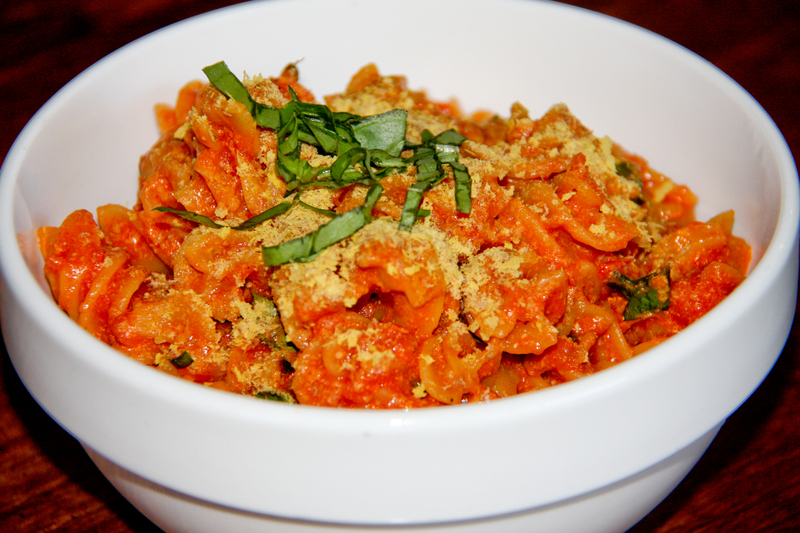 The recipe in this post is one that I came up with and has been a regular in my kitchen since. It is so quick and tasty. I need to address the fact that the Sriracha sauce in the recipe is not completely vegan. There is some fish extract in the sauce (way down on the ingredient list). While I eat a plant based diet and do not eat any animal flesh, I do on occasion consume sauces that have fish extracts in them. 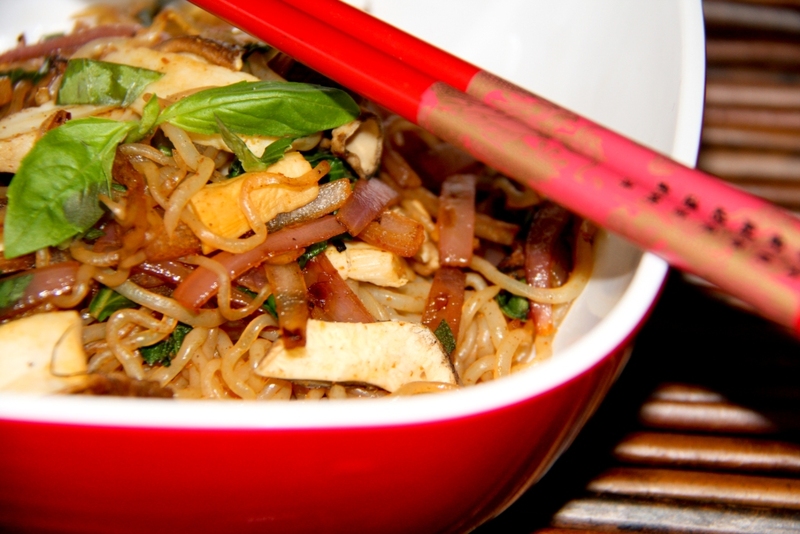 I married into a Chinese family and have picked-up so many wonderful cooking tips from them. They have also intriduced me to some really great marinades and sauces. I feel that these sauces make up such a small percentage of my daily diet that I am personally OK with using the sauces in small amounts (i.e.this recipe only calls for 1/4 tsp. 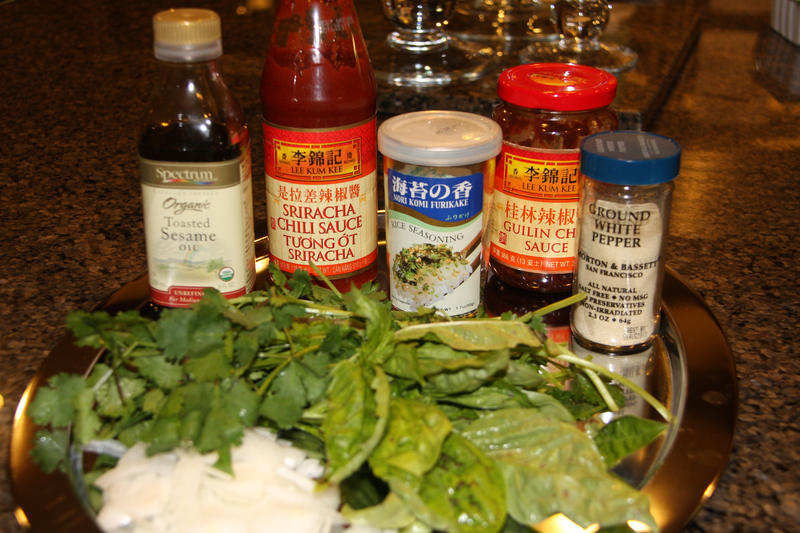 of Sriracha…of that 1/4 tsp, the fish extract is the 5th ingredient). 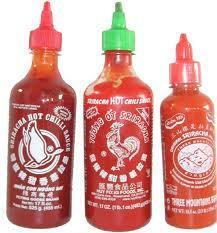 *A reader wrote in to let me know that the Sriracha with the rooster IS vegan…that is so great to know. The bottle of Sriracha in my fridge is a different brand and contains fish extract. 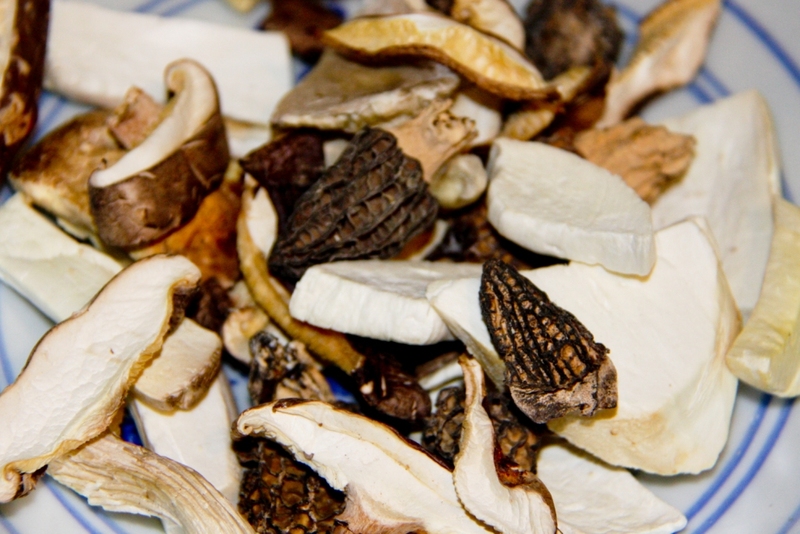 Pour hot water over the dried mushrooms. Once reconstituted, slice to desired size. 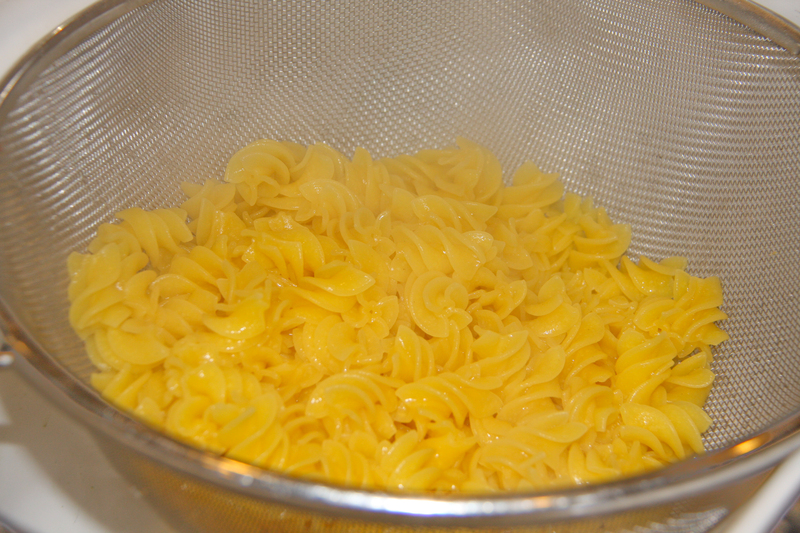 Rinse the noodles in a colander and drain. 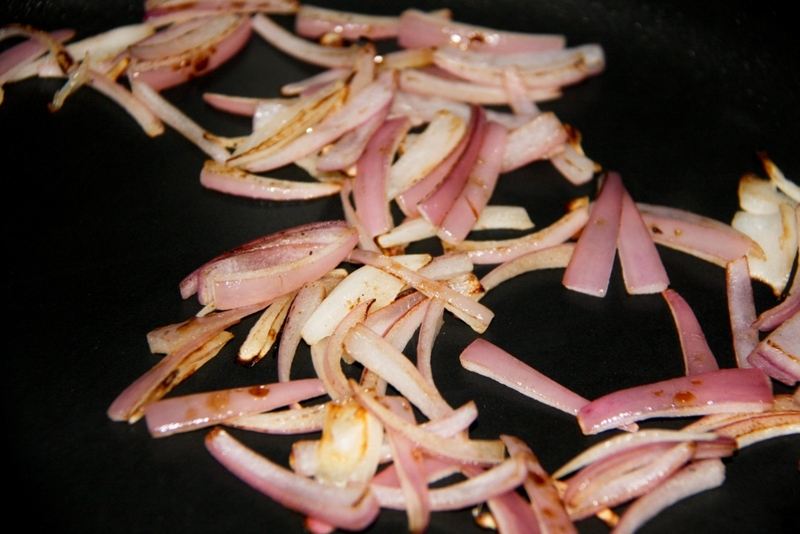 Pour a very slight amount of olive oil into a pan and sauté the onions. 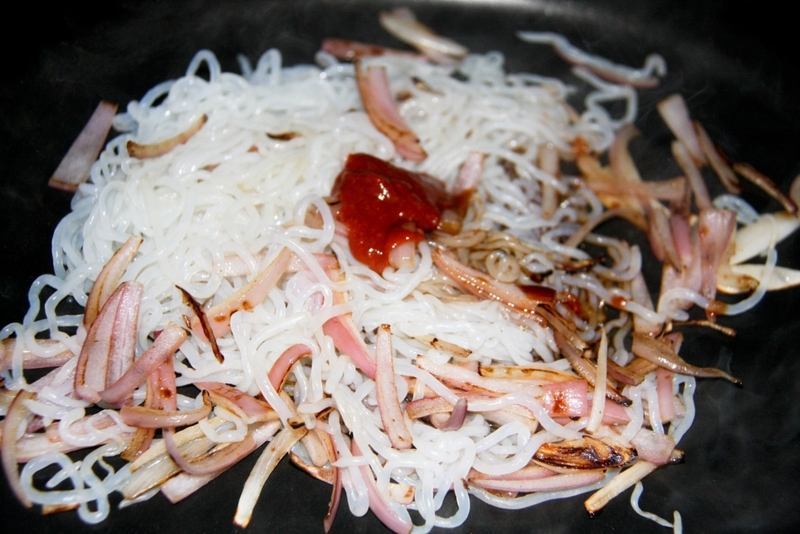 Once the onions are translucent and slightly browned, add in the Miracle Noodles. Toss to incorporate and then add the Sriracha sauce and soy sauce. Mix well. 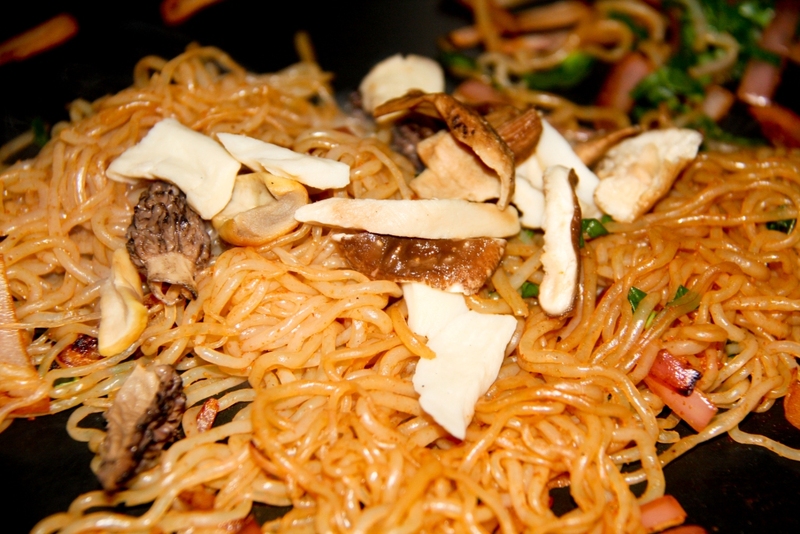 Finally, add the mushrooms and basil and toss to incorporate. Whenever I cook lasagna I make a HUGE one and I tend to do it on a weekend or an afternoon when I know I will be home for the rest of the night. 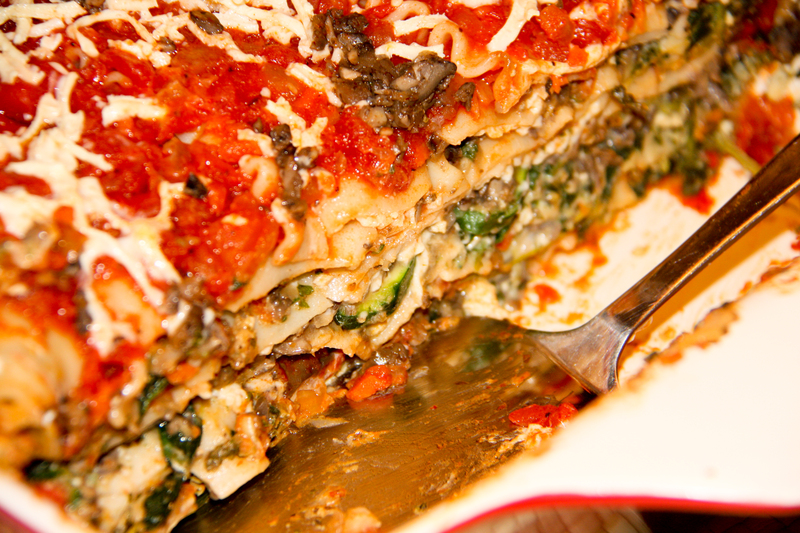 If you are going to go to the trouble to make lasagna, why not have it be big enough to last for a few meals? 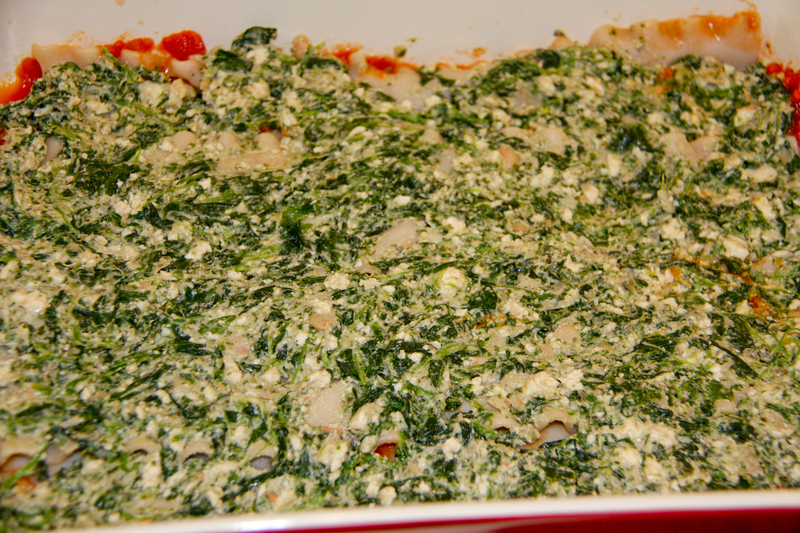 When I make this lasagna it lasts my family of 4 (2 of which are children) 3 whole dinners! We eat it fresh out of the oven one night and then I usually freeze the other 2 sections for 2 other nights. You pop it in the oven for an hour from the freezer, make a salad, and you have a fantastic dinner! I just cooked one of my frozen lasagna sections and IT DOES NOT REHEAT WELL when using gluten free lasagna noodles (they turned to mush). The lasagna tastes AWESOME the first night and when reheated as left-overs, but unfortunately I can NOT recommend reheating it from the freezer. Bummer. 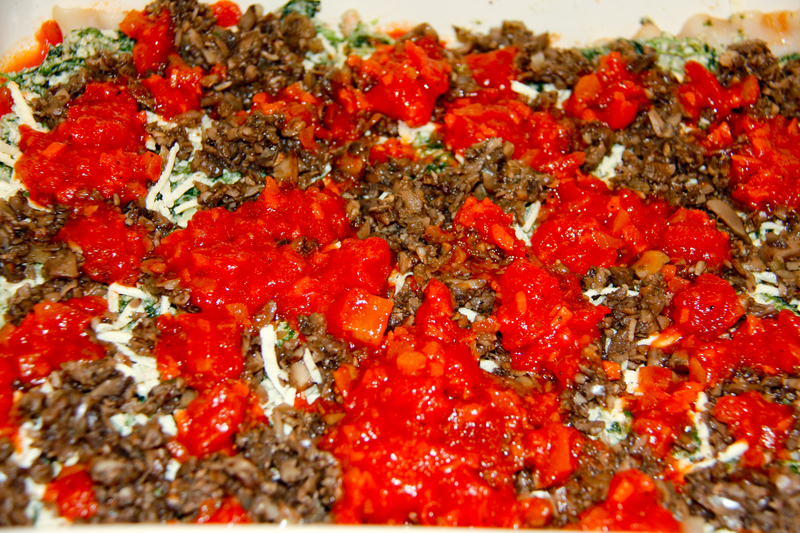 The next time I make this lasagna I am going to cut the recipe in 1/2. As for the cheese, it has taken a lot of experimenting, but I have finally come-up with what I call my Vegan Herbed Ricotta. I am not a big fan of using very much soy in general (A LOT of the recipes you will see for vegan lasagna rely on tofu tremendously), so through trial and error I have come up with a recipe that only uses ½ a brick of extra firm sprouted tofu and the rest of the cheese is comprised of beans, vegan goat cheese, and herbs and spices. When you think about it, ½ a brick of tofu spread out over three dinners for four people is very nominal. While it is a time investment to make lasagna, the end result is so very worth it and will pay off when you realize you have made 3 meals! 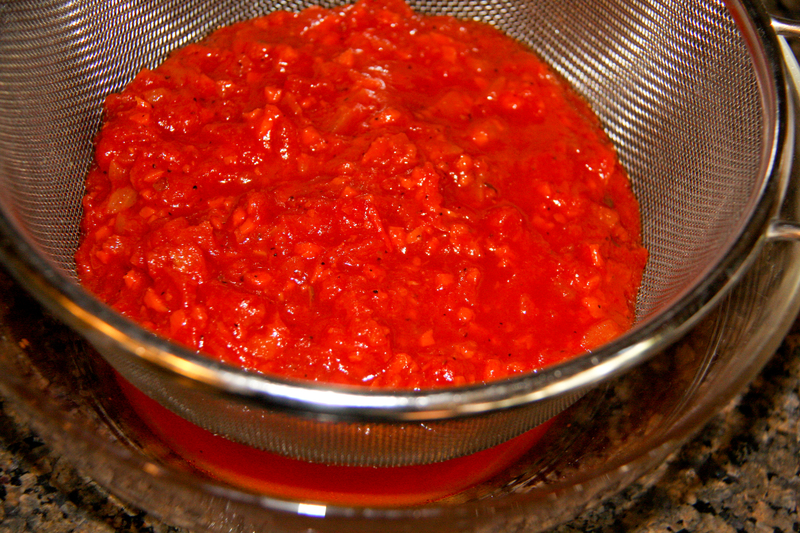 Place a strainer over a bowl and pour one of the jars of pasta sauce into the strainer. 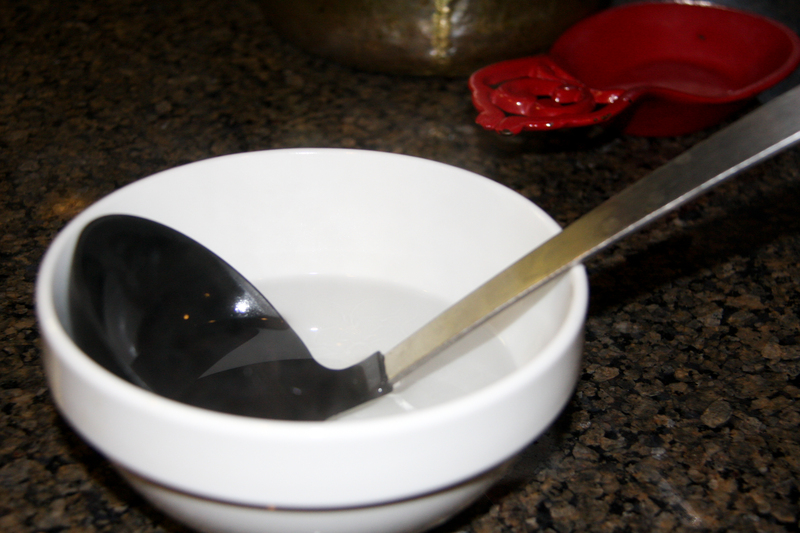 You want most of the liquid to strain into the bowl. 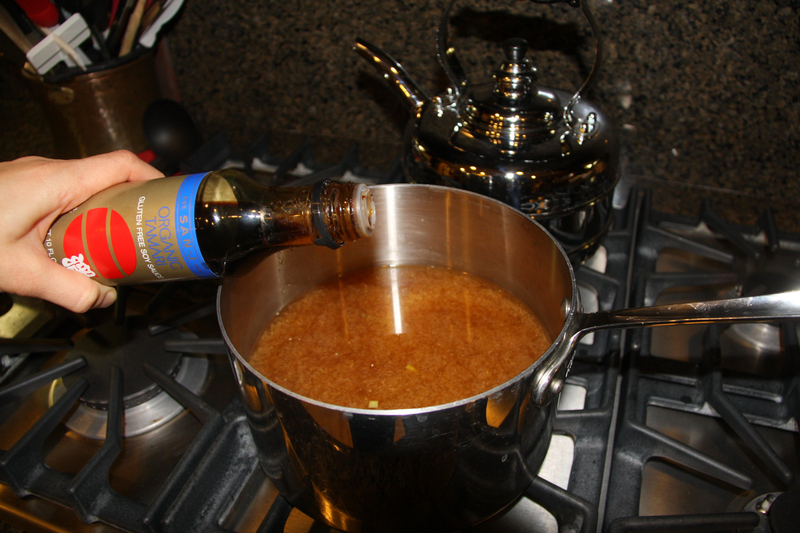 You may need to stir the sauce a few times to help release most of the liquid. 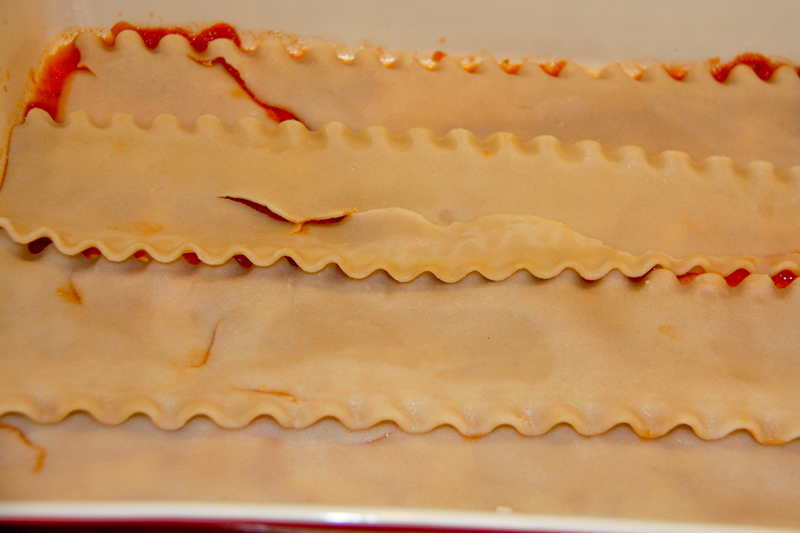 While the pasta sauce is straining, cook the lasagna noodles according to the instructions on the box. 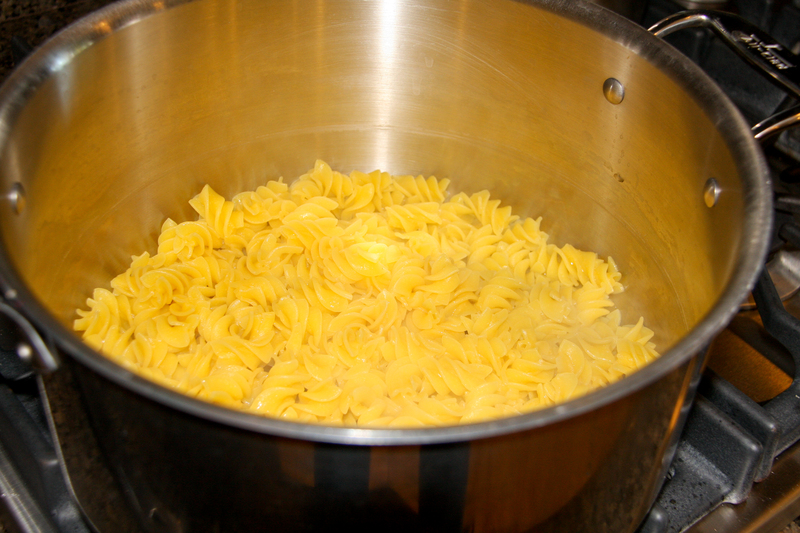 I am always leery about noodles that claim they do not need to be precooked, so I always precook them. It really doesn’t add much time to the process since they will cook while you are preparing the other ingredients. 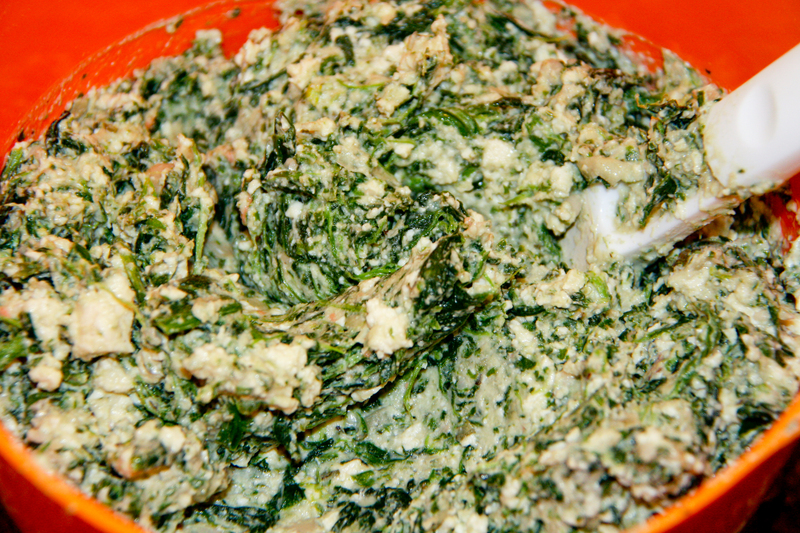 While the noodles are cooking, make the Vegan Herbed Ricotta. Place the vegan goat cheese and sprouted tofu in a bowl. 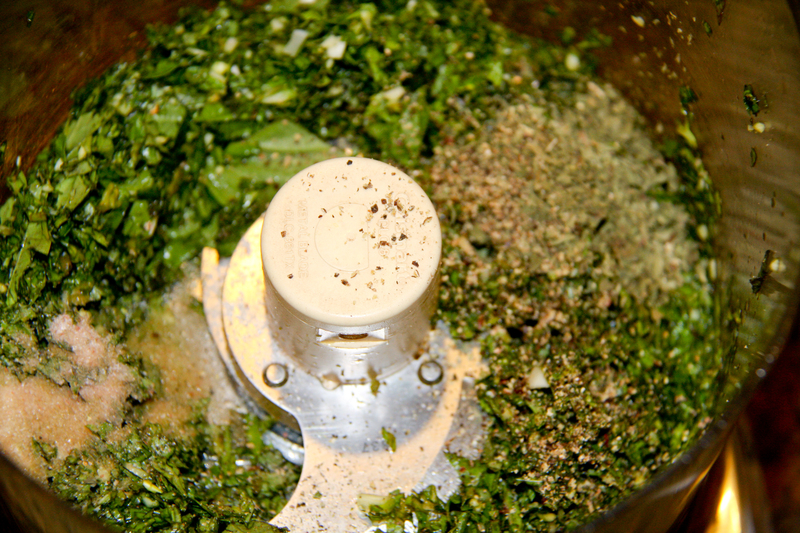 In a food processor fitted with the S blade, pulse together the basil, garlic, oregano, salt, and pepper. You will need to stop and scrape down the bowl of the processor a few times during the process. 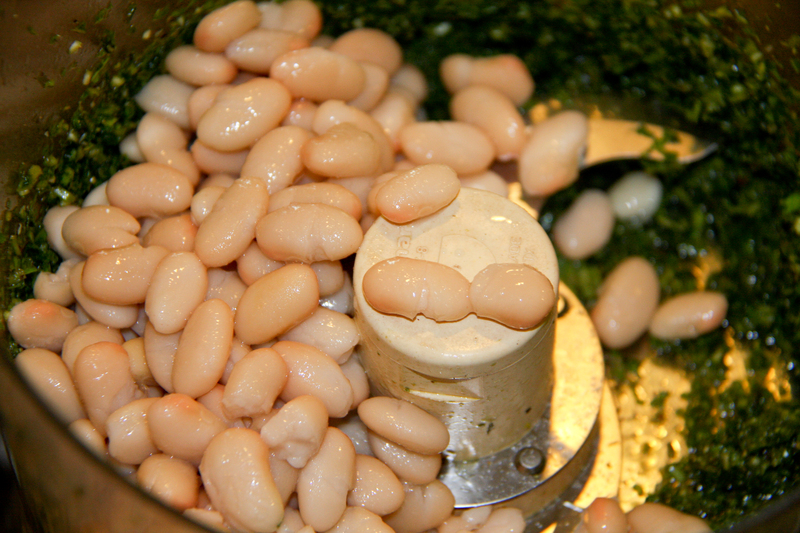 Once the mixture resembles pesto, add the great northern beans and pulse only a few times since you want the beans to maintain some texture. 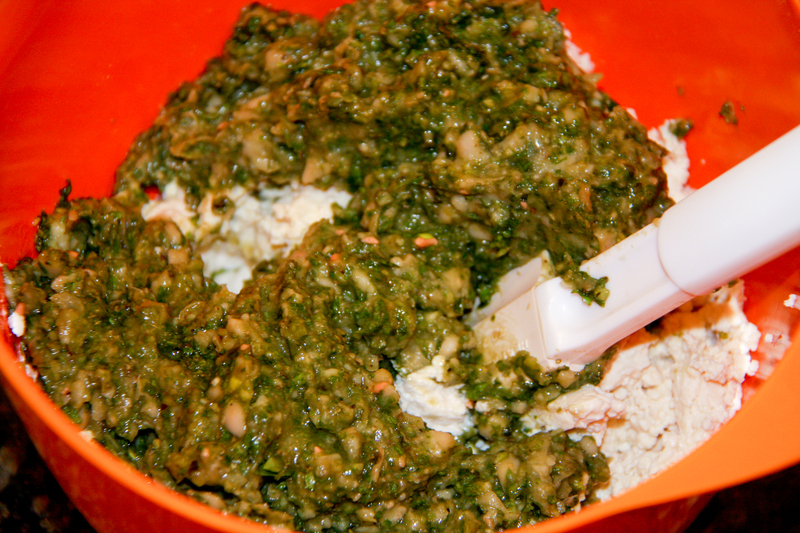 Gently fold the mixture from the food processor into the vegan goat cheese and crumbled tofu. 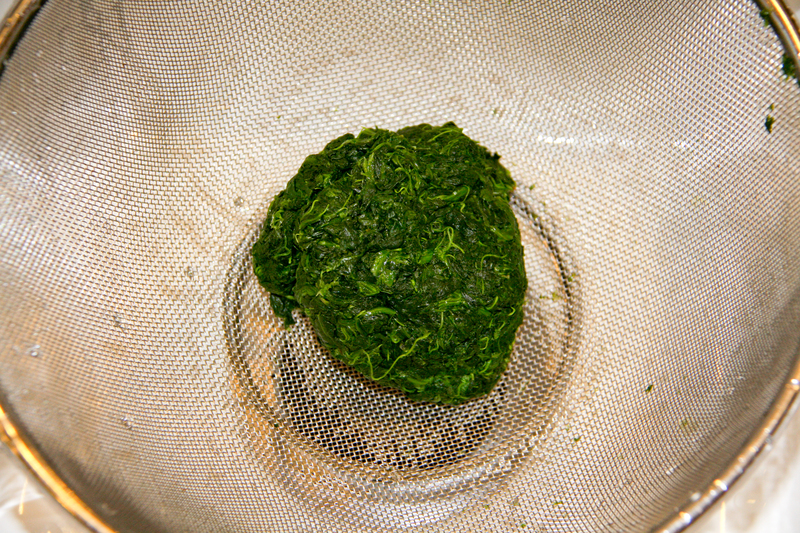 Once well combined, gently fold in the spinach (which you have squeezed ALL of the liquid out of so it forms a nice dry ball). 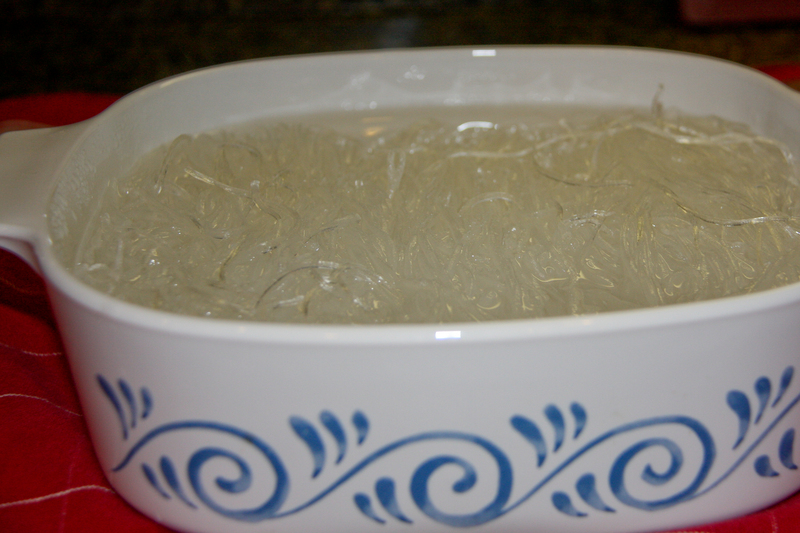 Now that the noodles are done cooking, rinse them under cool water. 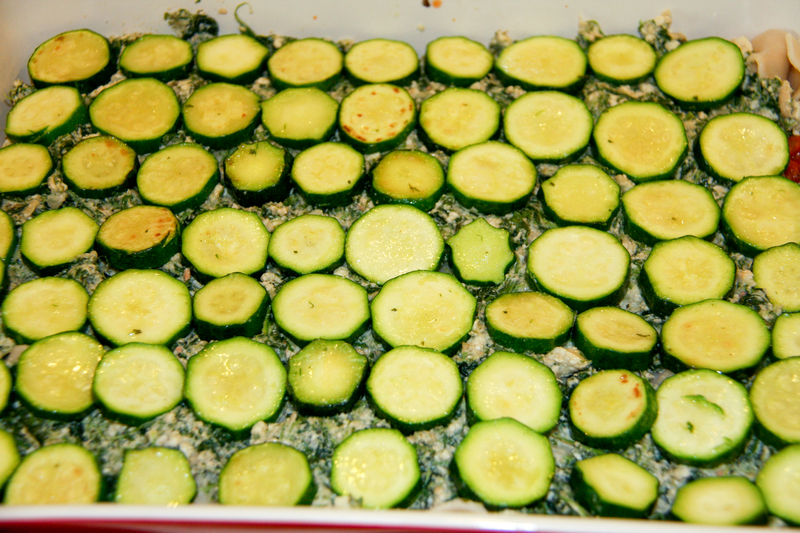 Once rinsed, lay them out in a single layer to prevent sticking (I use sheet pans). 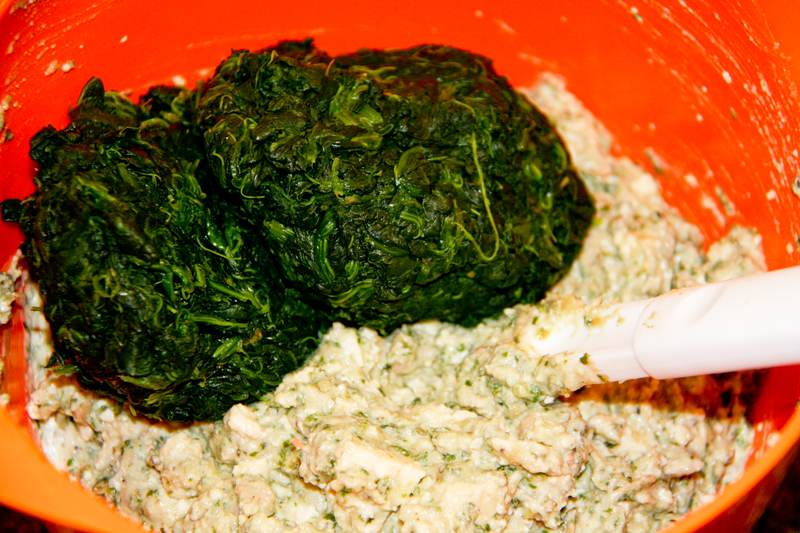 Without washing the food processor bowl (save yourself some time, there is no real need) place the mushrooms one bag at a time into the food processor and pulse until they are fairly well chopped, but maintain some texture. 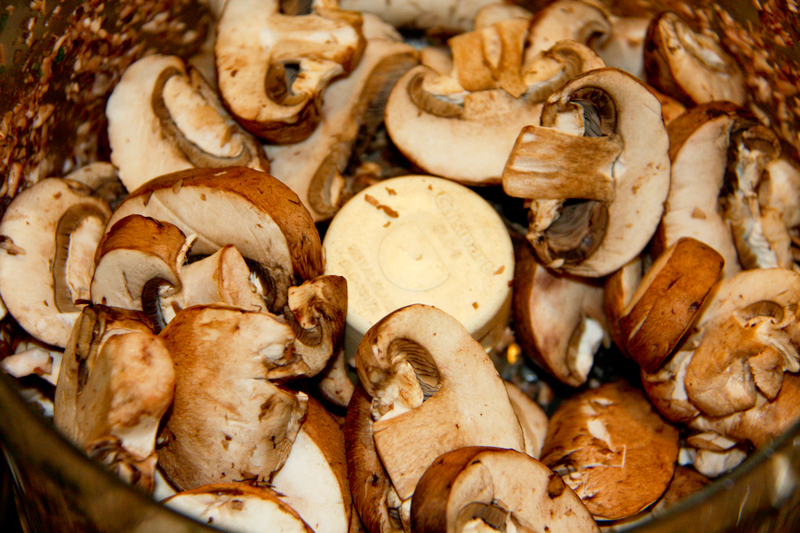 Pour the mushrooms into a large pot. Repeat with the other three bags until all of the mushrooms are chopped. 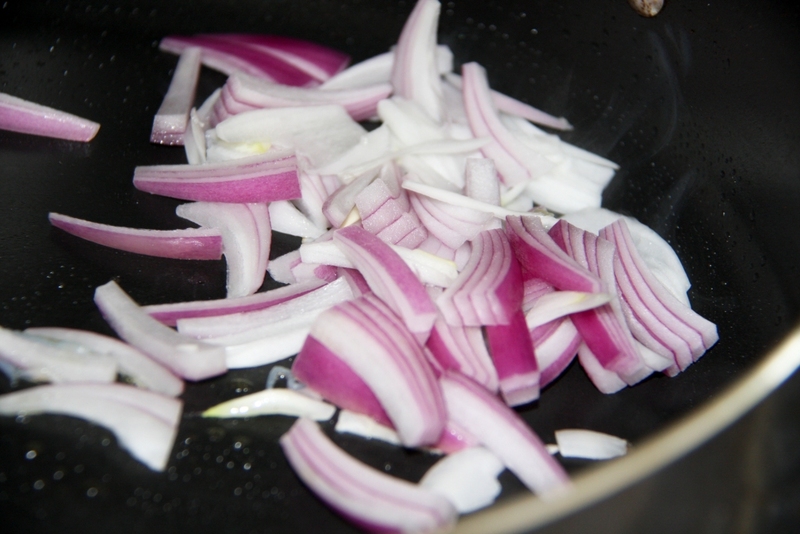 Roughly chop the onions and place them into the unwashed food processor bowl. 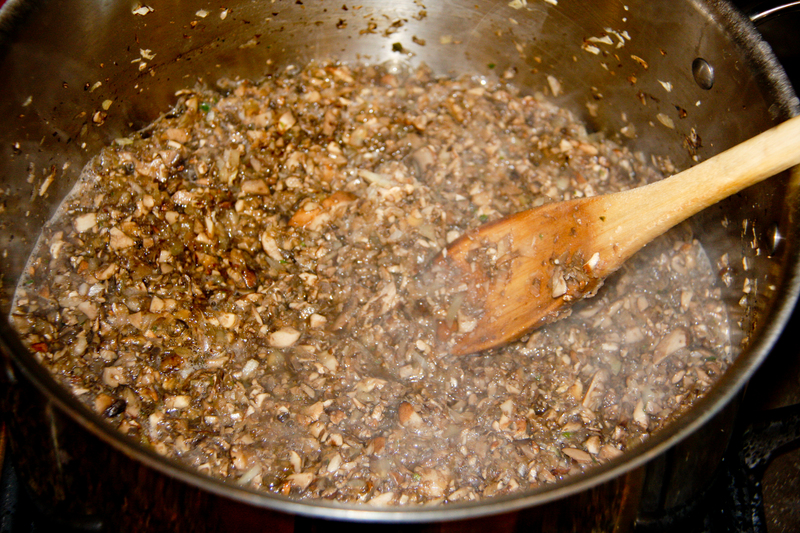 Pulse until finely chopped and add the onions to the pot with the chopped mushrooms. Turn the burner onto medium and cook the mushrooms and onions down. 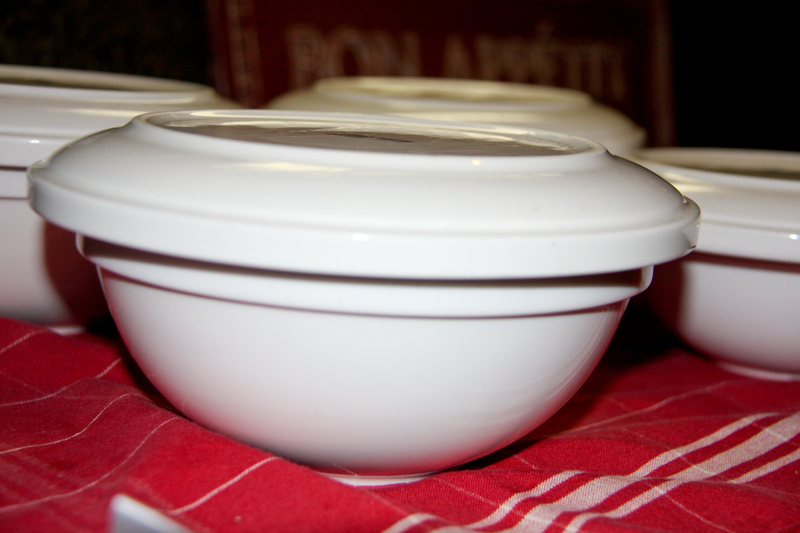 Place the lid on the pot to speed-up the process. 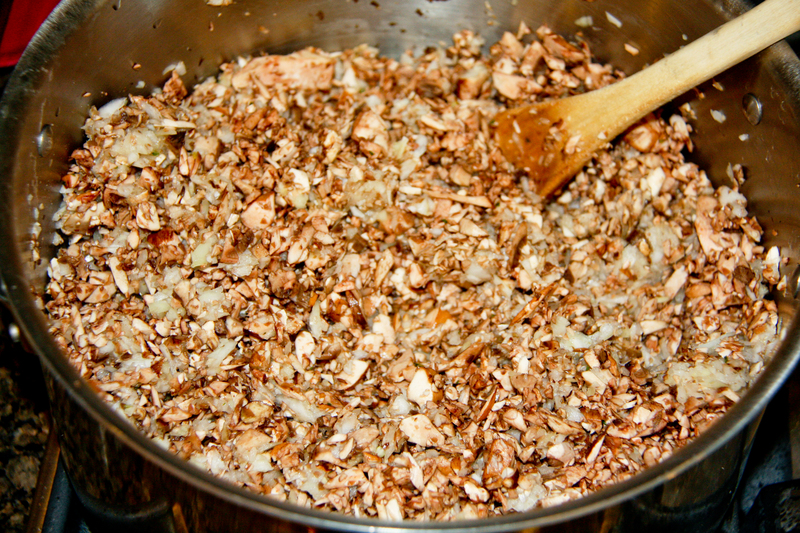 Once the mushrooms and onions are cooked (approx. 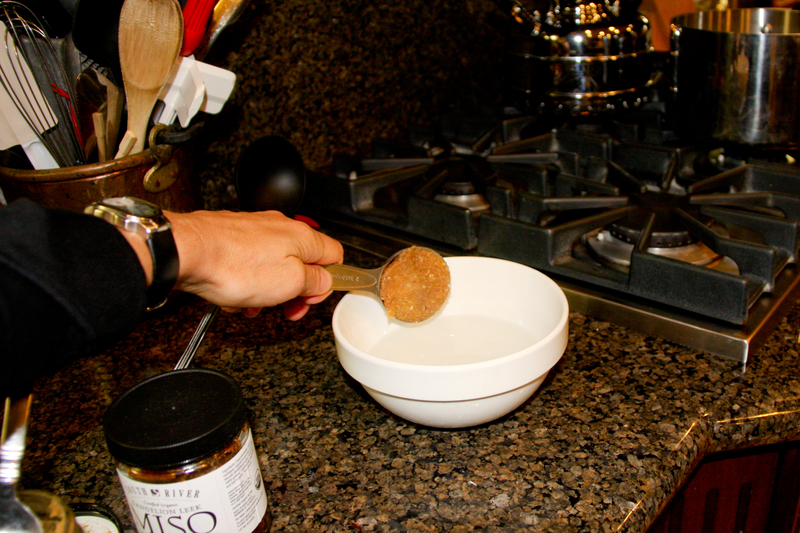 10 minutes), pour them into a strainer to strain out all of the liquid. Once strained, salt and pepper to taste. 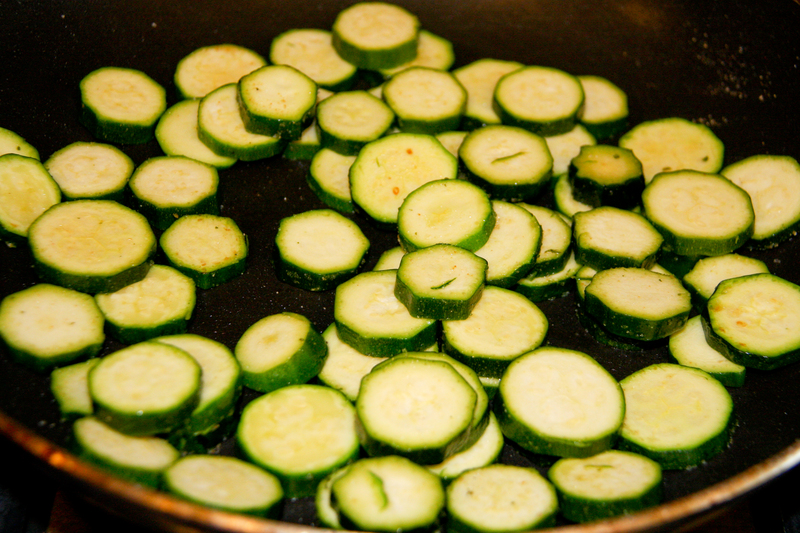 Chop the zucchini into 1/8” wheels and sauté on medium heat with 1 tsp oil. You want the zucchini to brown very slightly. This should only take 3-4 minutes. Flavor the zucchini with garlic salt to taste. 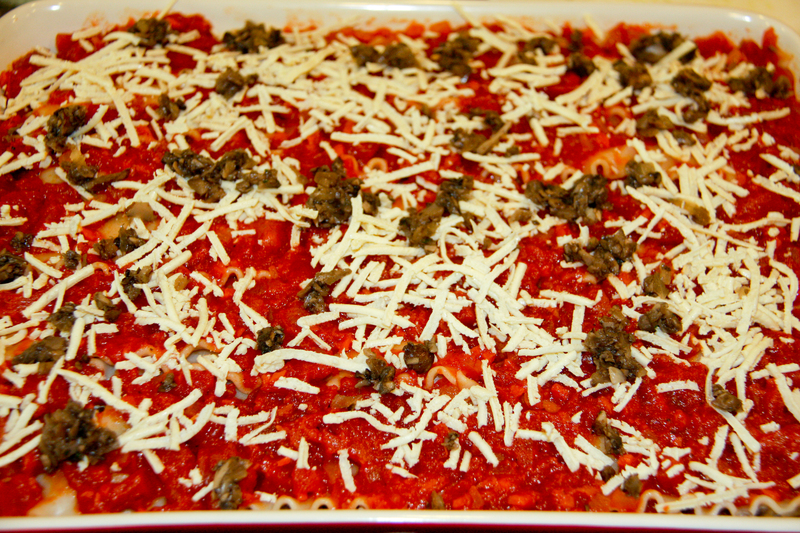 It is now time to assemble the lasagna. Pour one third of the unopened pasta sauce (NOT the pasta sauce you are straining) into the bottom of a 10” x 12” deep casserole dish. Follow with a layer of lasagna noodles, 1/3 of the Vegan Herbed Ricotta, 1/3 of the Daiya, and 1/3 of the mushrooms, and another 1/3 of the sauce. 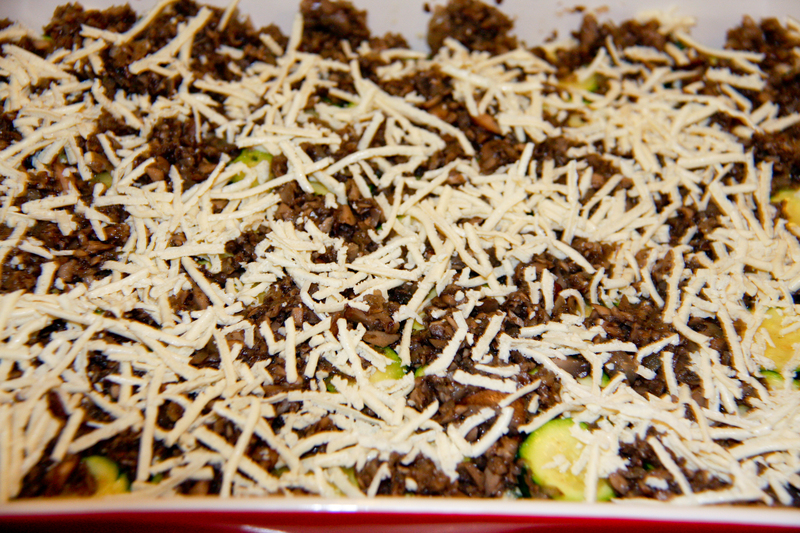 Follow with another layer of noodles, 1/3 of the Vegan Herbed Ricotta, all of the zucchini wheels, most of the remaining mushrooms (reserve some for the top of the lasagna), most of the remaining Daiya (reserve some for the top of the lasagna), and the last 1/3 of the jar of pasta sauce. 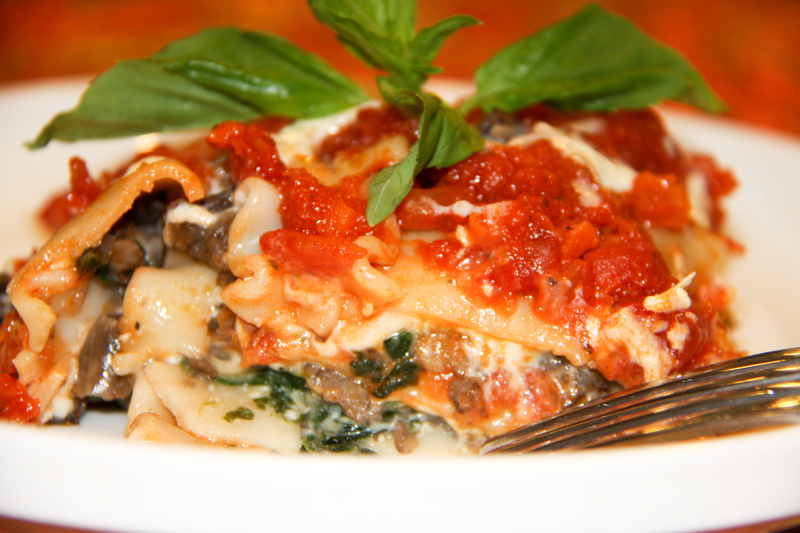 Top with the last layer of lasagna noodles, the ENTIRE jar of the strained pasta sauce (reserve the liquid for an alternate use…you will not need it for this recipe…if you put it into the lasagna it will become soggy), any remaining mushrooms, and the remaining Daiya. 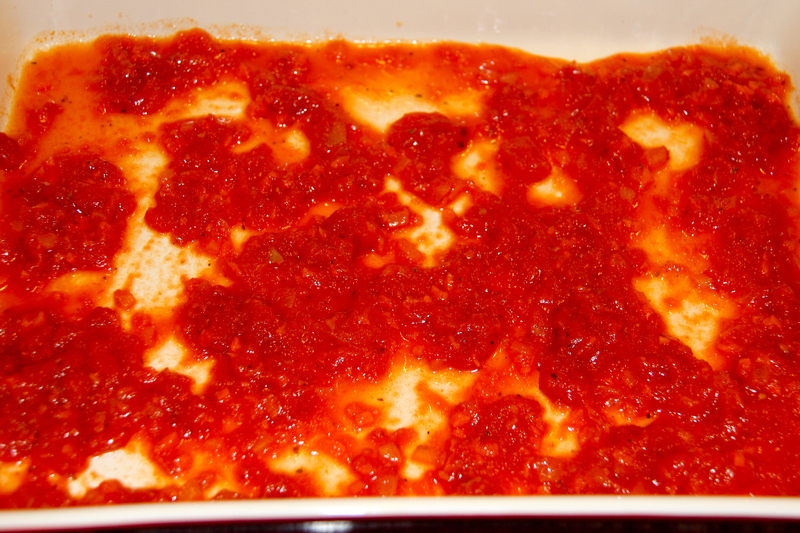 Cover the lasagna with a piece of foil that you have oiled on the inside so it won’t stick to it. Cook the lasagna for 1 hour at 400°. Yesterday as I was contemplating what to have for lunch, the basil and quinoa in the fridge started calling me…the rest just sort of fell into place when I looked at what I had on hand. 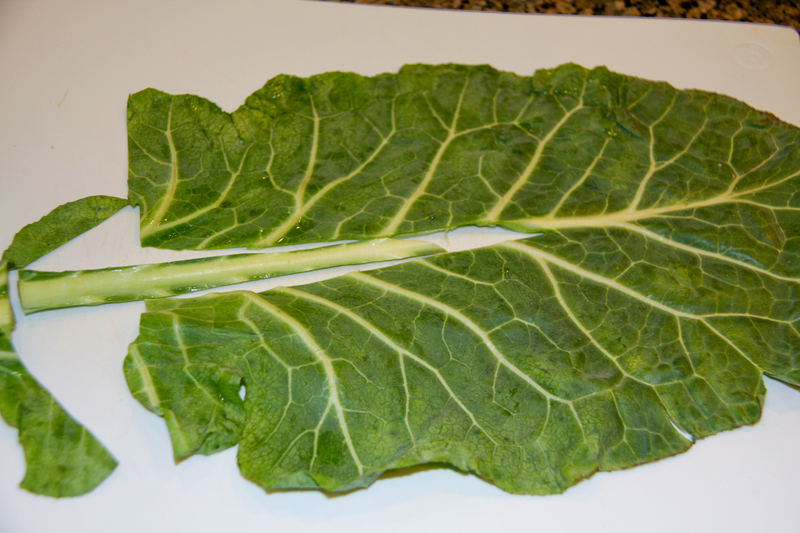 The collard greens came from my most recent Farm Fresh to You delivery. 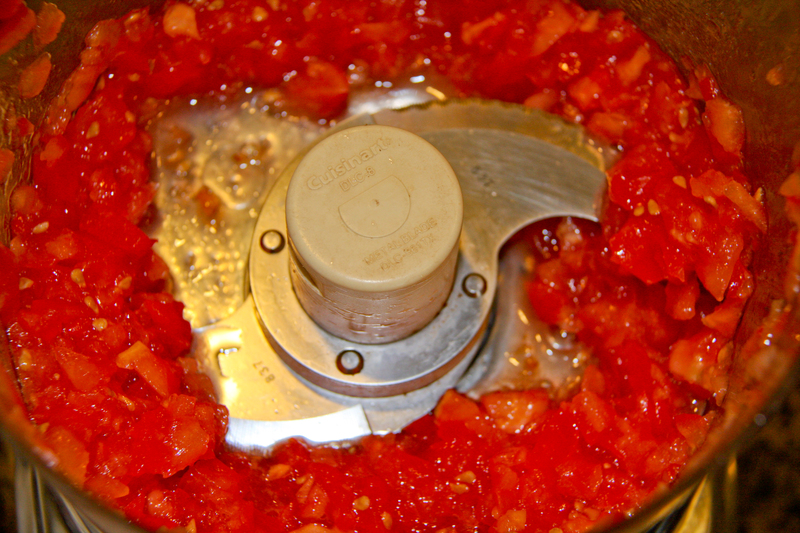 Add the chopped tomatoes to the food processor and pulse. 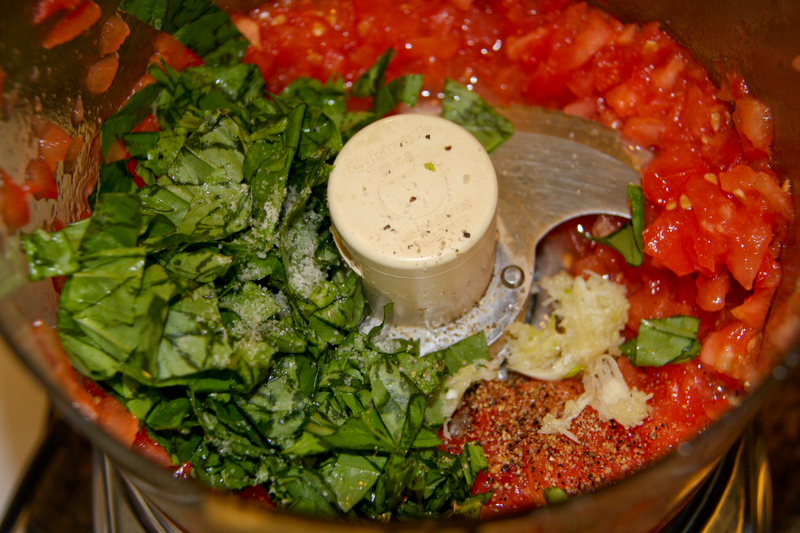 You want to maintain some of the tomato’s texture, so do not puree it. 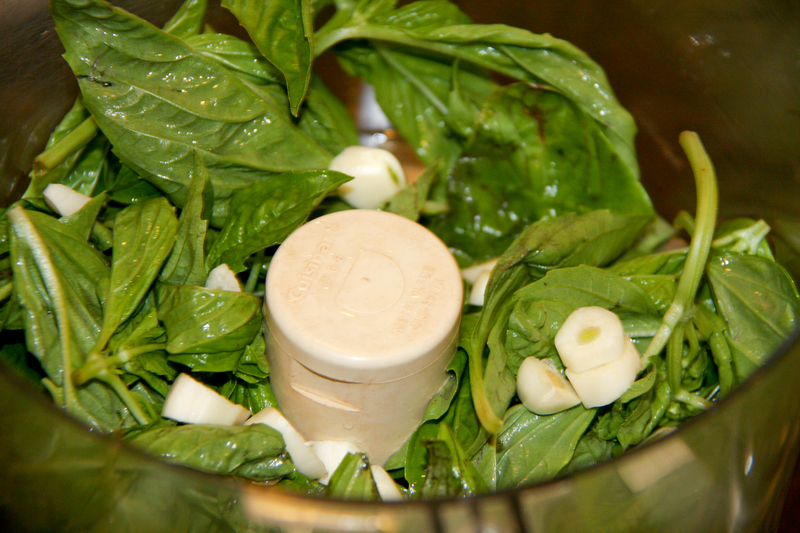 Next add the basil, garlic, salt, pepper, and balsamic vinegar. Pulse again to incorporate. 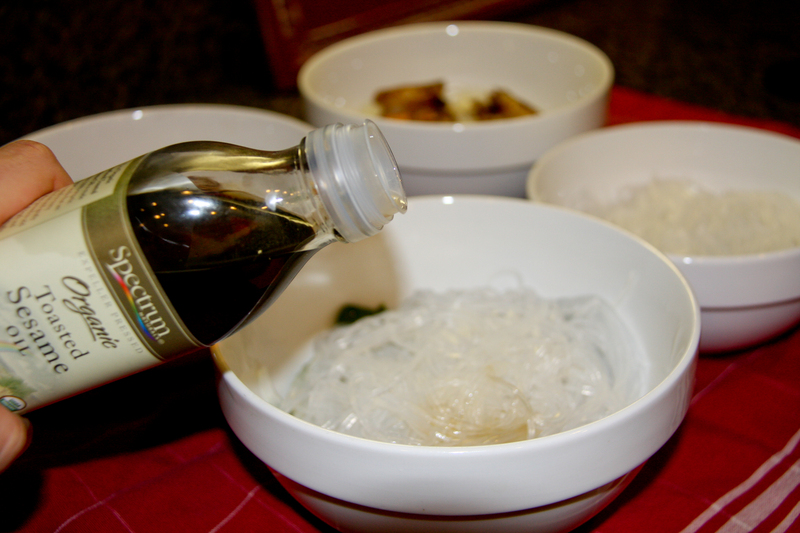 Set the mixture aside to marinate while you prepare the other ingredients. 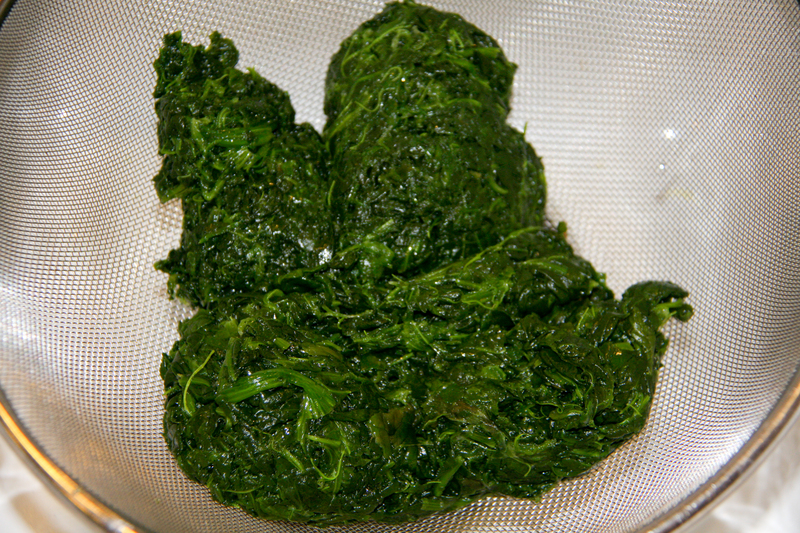 Wash the collard greens and dry both sides. 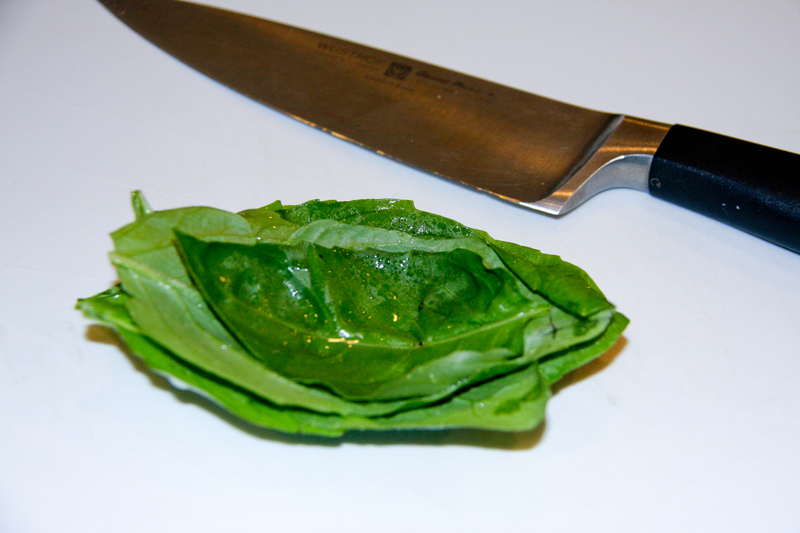 Remove the lower stem and most of the rough bone in the middle of the leaf. 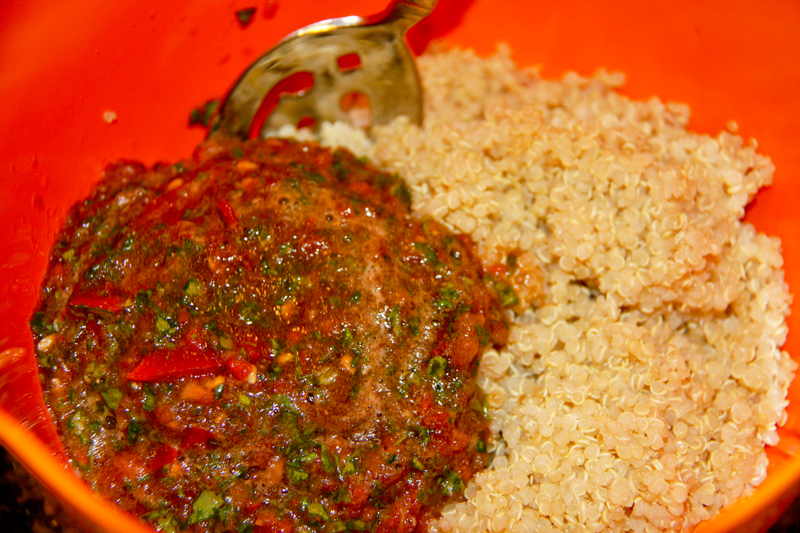 Place the quinoa in a bowl and add the tomato mixture to the quinoa. Stir to combine. 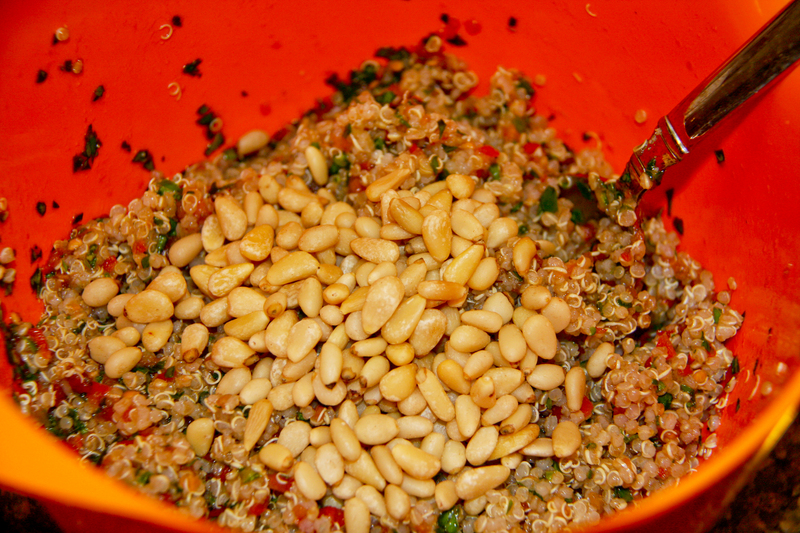 Add the pine nuts and mix well. 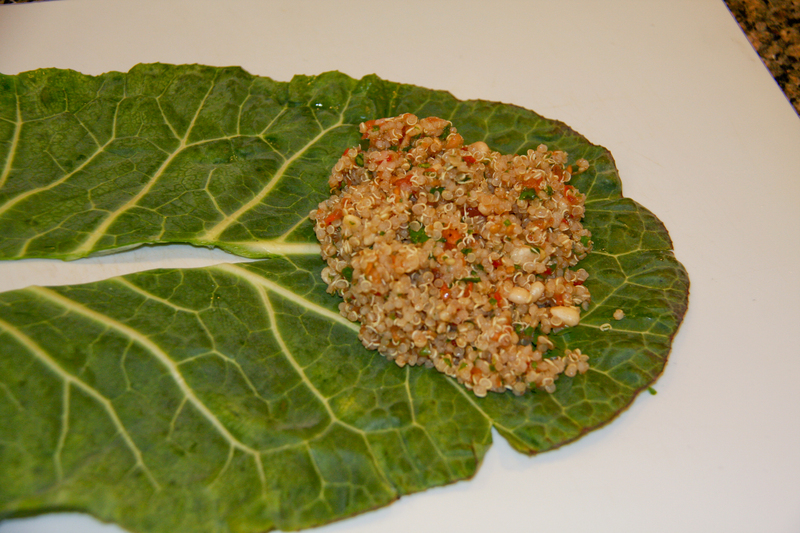 Assemble the wraps by placing 1/3-1/2 of a cup of the filling onto the top third of the collard green leaf. Roll the leaf tightly as you would a burrito being careful to overlap the bottom portions that were separated by the removal of the rib (you don’t want the filling to fall out). 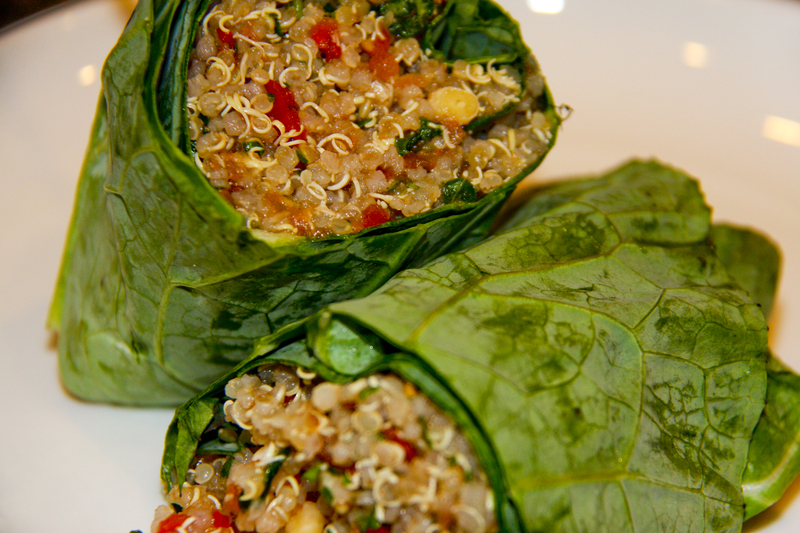 Repeat this step until all of the wraps have been made. I made all six and plan to keep them in the fridge as lunches or snacks for the rest of the week…we will have to see how long they last though since I have already eaten two of them! Happy Valentine’s Day!!! I hope you have a loved filled day. I know many of you will be rushing off to have dinner with your honey tonight and need a quick meal solution for your little ones and the sitter. My children love this meal and I love how quick it is (we ate it for lunch on Saturday). 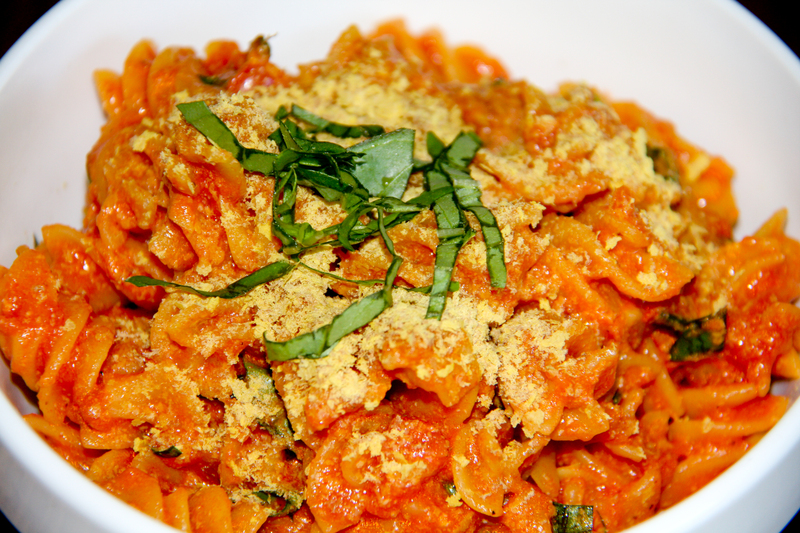 The nutritional yeast acts as a great substitute for parmesian cheese…it makes the pasta sauce nice and creamy all without having to use dairy…good stuff! 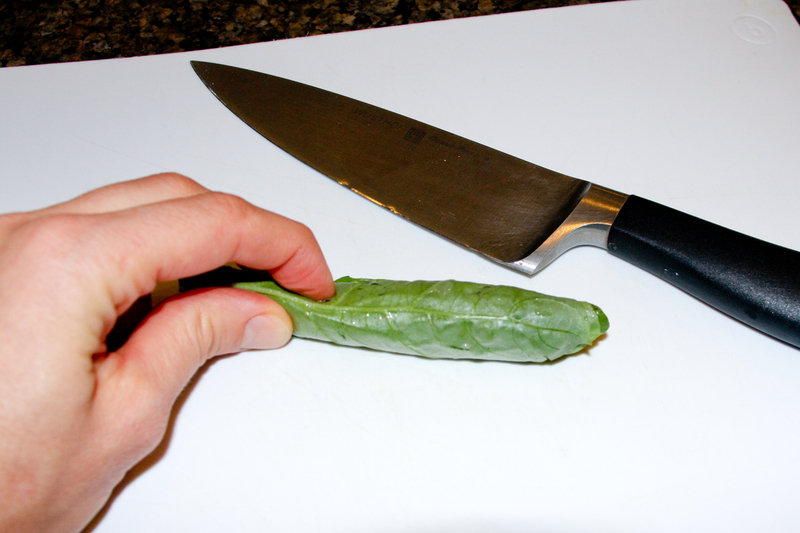 While the pasta is cooking, chop the basil. 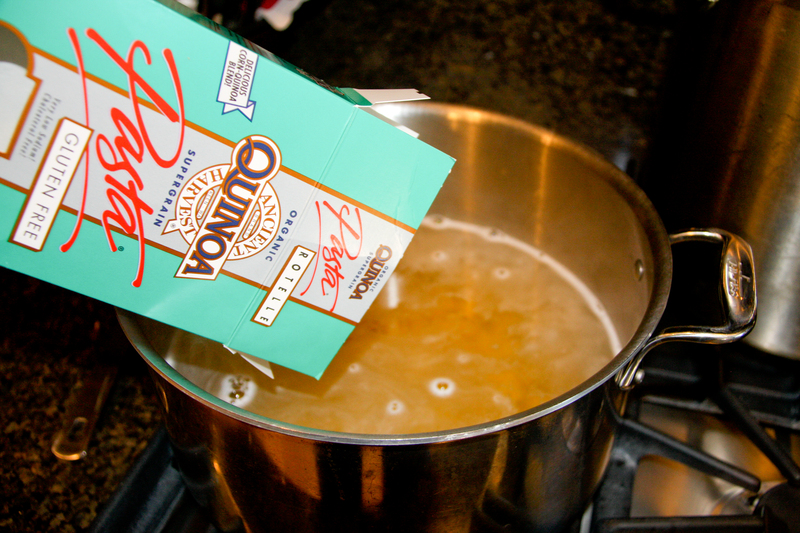 When the pasta is done cooking, strain it and return it to the pot. 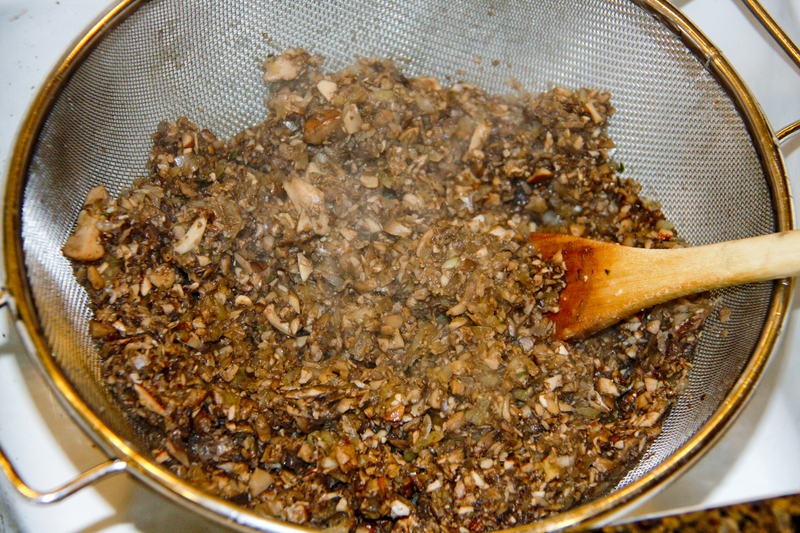 Add all of the remaining ingredients to the pot and mix well. Thats it! 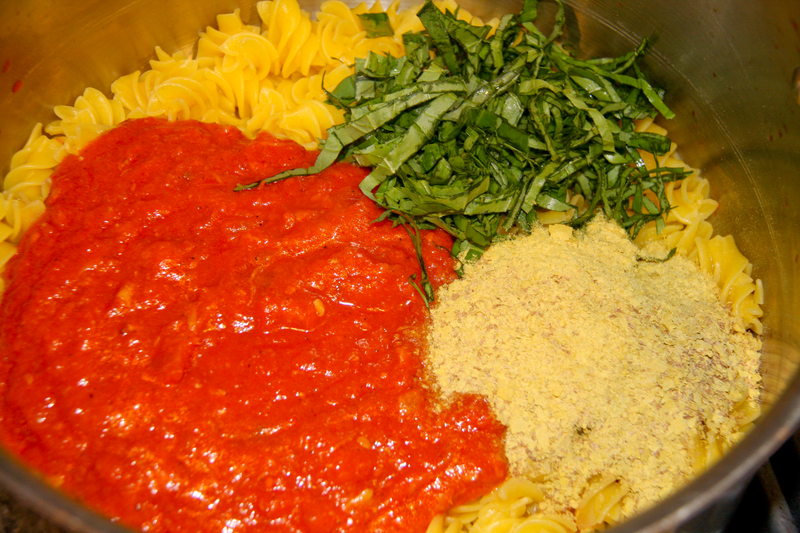 Garnish with some more nutritional yeast and basil. Ask the kids to help prepare a side salad and dinner is done. I am a big soup fan. A few nights ago when we were getting ready to go on our ski trip to Mammoth, I needed to make dinner with the food we had on hand…I wanted to try and minimize what we had to leave in the fridge. 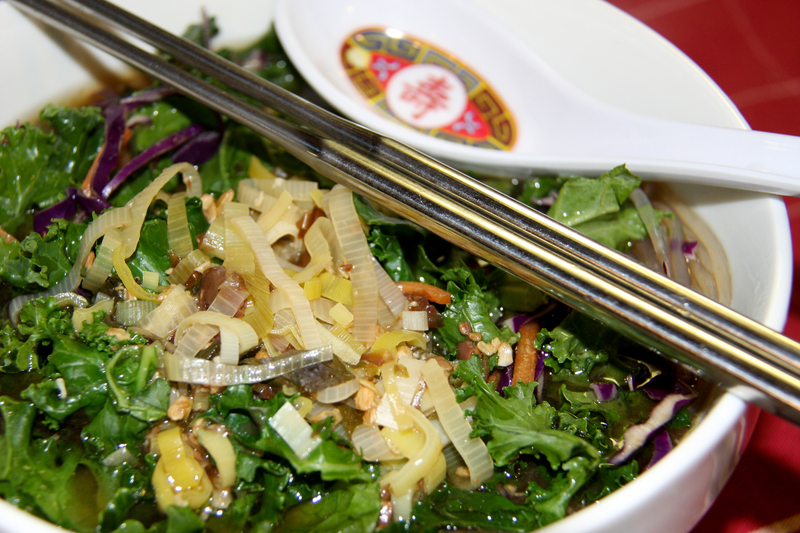 Noodle soup is always a good option. 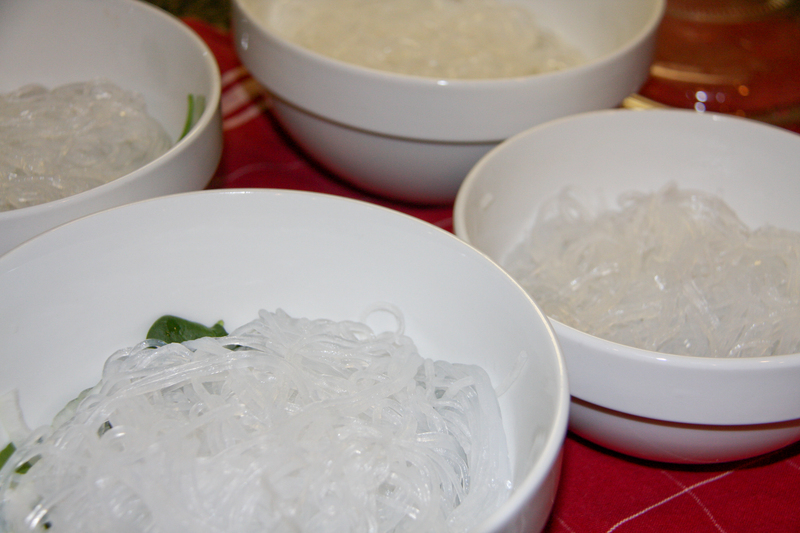 I keep mung bean noodles (also known as Saifun Noodles) in the pantry for nights like those. 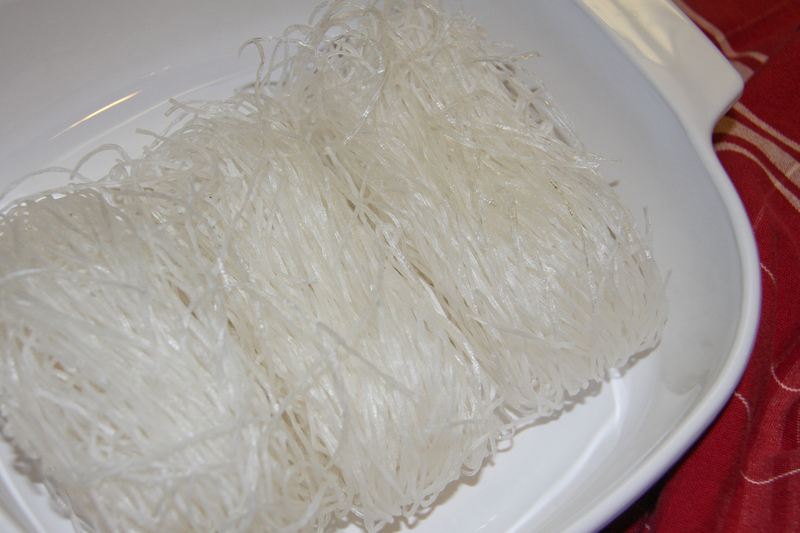 Usually each package of dry noodles comes with three bundles of noodles inside, so they pack a big punch for a small cost. I didn’t have any broth in the pantry, but I did have some outstanding miso in the fridge from South River Miso Company, so that became the basis of my soup broth. 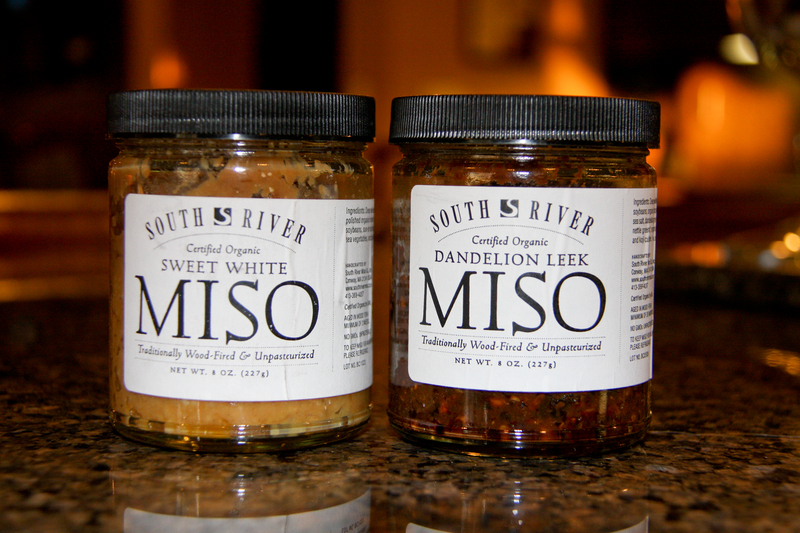 South River Miso is a great small company that really focuses on quality and their products are really special. 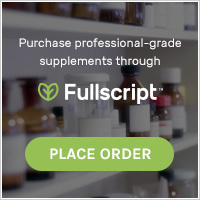 To find out more about their company and order their products click here. 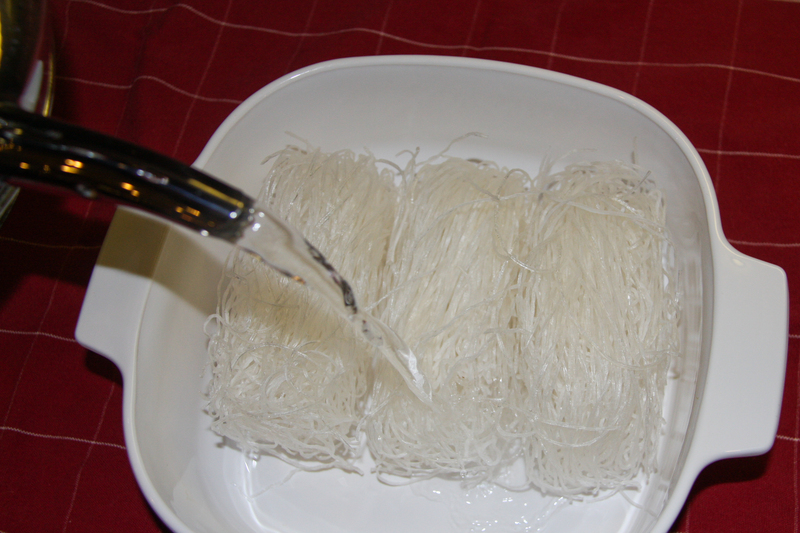 I begin by soaking the mung bean bundles in hot water. I tend to make a very mild broth with the intent that people will personalize their soup at the table. 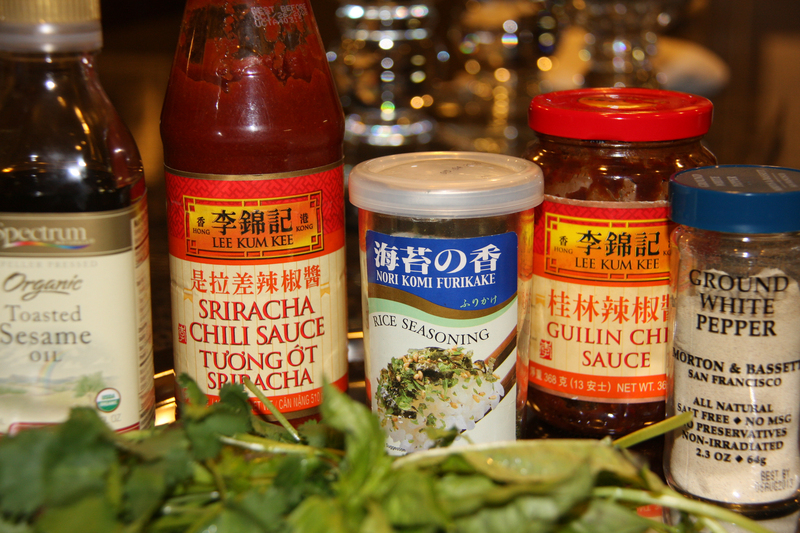 Our family’s taste tends to cover the whole spectrum from very mild to crazy spicy! 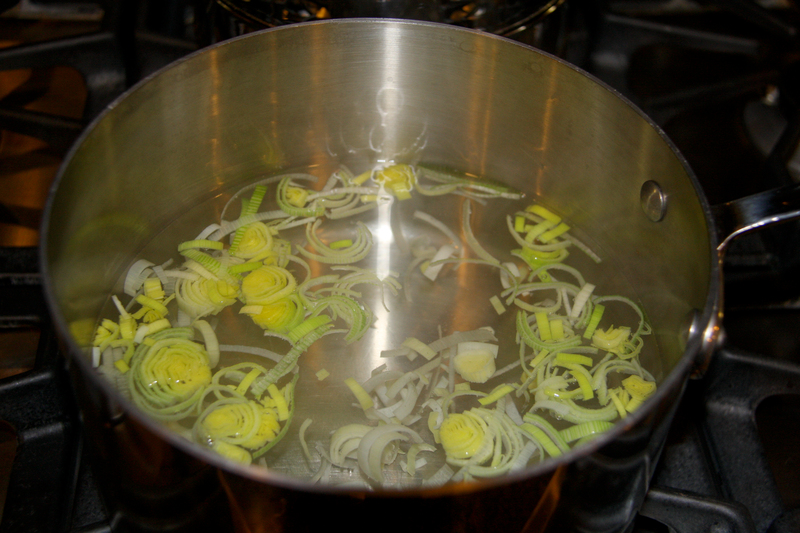 To make the broth this time I boiled water and added leeks to it for flavor. 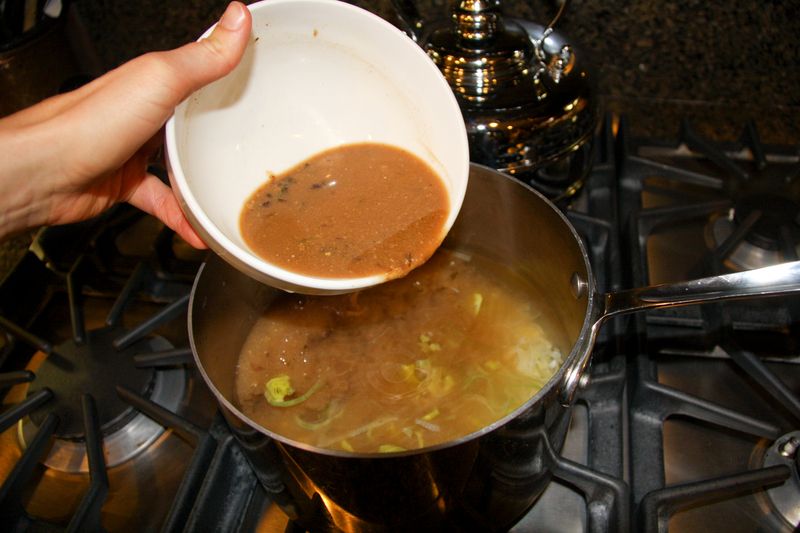 Once the leeks have flavored the broth, ladle some hot water into a bowl and mix the miso paste into the water in the bowl. 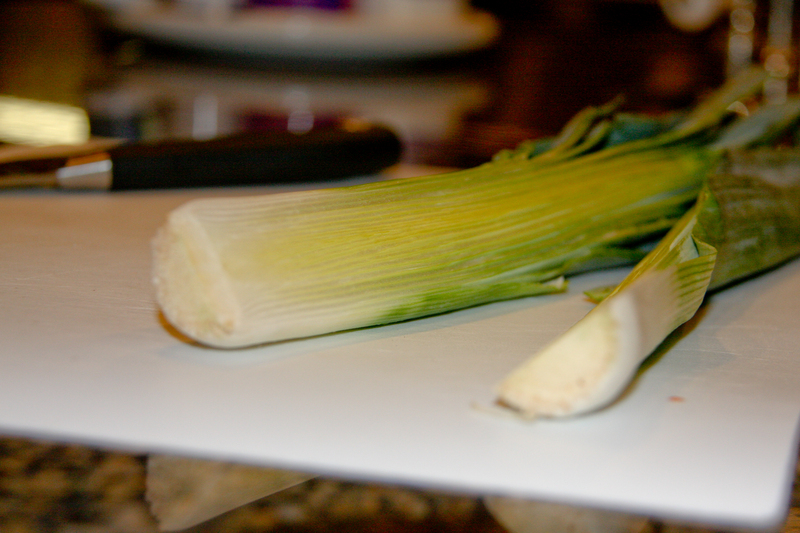 Pour the miso mixture back into the hot water and leeks. Flavor with tamari if needed. Now prepare the bowls for the soup. Pour the boiling hot prepared broth over the noodles and cover for a few minutes. 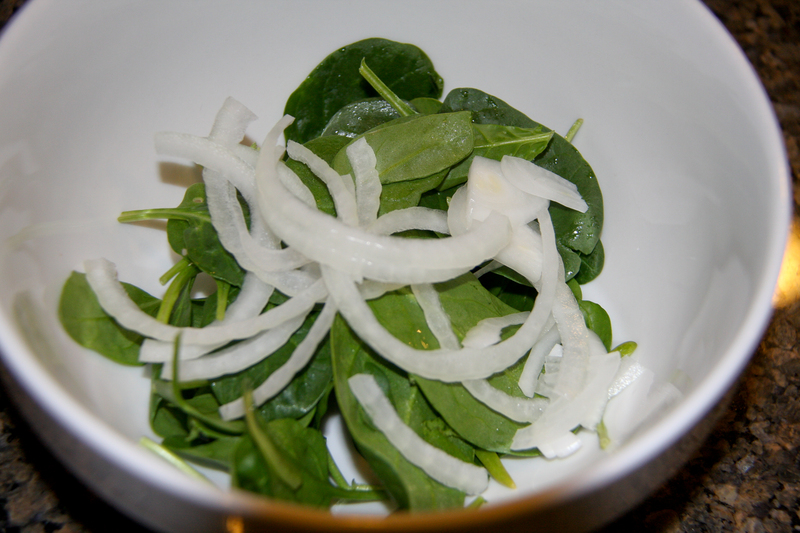 The hot broth will cook the onion and spinach. Now serve with the accompaniments. Flavor your soup and enjoy. 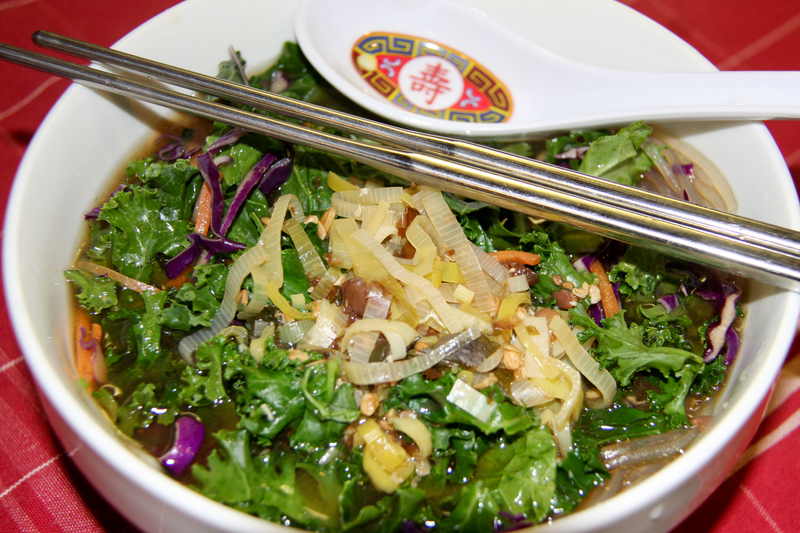 I was in a kale mood, so I completely covered my soup with kale before I put the broth in and covered it with a lid.